If we didn’t say so, you’d probably never know that these fantastically fruity Berry, Apple + Spinach Veggie-Go’s Strips are packing some serious greens. Sweet potatoes too. This fan-favourite flavour wins big with fruit lovers because it leads with the natural sweetness of strawberries, blueberries, raspberries and apples and keeps the power-packed spinach incognito. So while we can’t endorse lying to your kids about what’s inside—food honesty is always the best policy—we can say that in this case, what they don’t know definitely won’t hurt them. 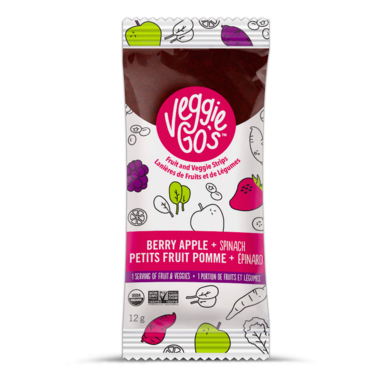 Ingredients: Organic Apple Puree, Organic Spinach Puree, Organic Strawberry Puree, Organic Raspberry Puree, Organic Blueberry Puree, Organic Sweet Potato Puree. So yummy and sweet! Wish they could be purchased in bulk. Great substitution when craving sugary snack in the afternoon. These are okay. I prefer other brands as I find this brand tough to bite into and tough to chew. Even my 4 year old says theyâ€™re hard to chew and I bought them for his lunch. These are a really great treat to reach for, when you have a craving for something sweet, but don't want to have a bunch of candy. My only gripe is that I would prefer to buy in a box, rather than one at a time. Did it taste good? Yes. Would I buy it again? No. SO expensive for what you get. Tastes how you imagine, like a fruit chew. Expensive but tasty! I love that it has less sugar than regular fruit bars, and my kids still love them. My kids love these (and me too!). 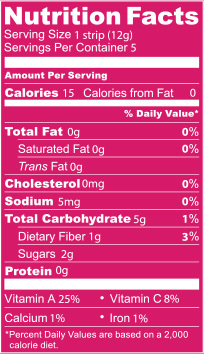 Low sugar, tastes great! I went right to my children with this product and it was a very easy sell because they did taste very good! I also tasted it and it is very good! I did not know what this was when I bought it. I still can't be entirely sure. But I like it.